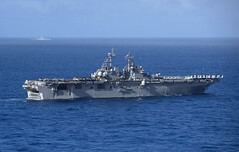 USS America (LHA 6) and USS Wayne E. Meyer (DDG 108) are set to arrive in Los Angeles Aug. 30 for Los Angeles Fleet Week, running through Sept. 5. The littoral combat ship arrived in Cebu, Philippines, Aug. 28, the second port call on the ship's transit back to its homeport in San Diego. 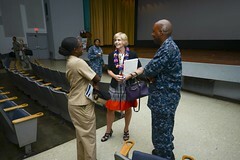 The Royal New Zealand Navy's 2015 Sailor of the Year visited Hawaii and the U.S. Pacific Fleet headquarters during a trip to the United States, Aug. 22-24. 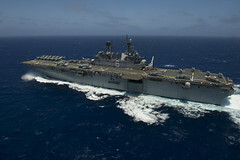 The Makin Island Amphibious Ready Group (ARG), Amphibious Squadron 5 and the 11th Marine Expeditionary Unit successfully completed a composite training unit exercise (COMPTUEX) off the coast of Southern California, Aug. 25. 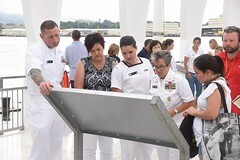 Service members and civilians from the Navy and Air Force gathered for the Hawaii Joint Forces Diversity Committee’s observance of Women’s Equality Day at Joint Base Pearl Harbor-Hickam Aug. 26. 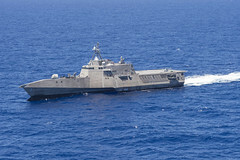 The littoral combat ship departed Joint Base Pearl Harbor-Hickam Aug. 26 to continue its independent deployment to the Western Pacific after participating in exercise Rim of the Pacific 2016. 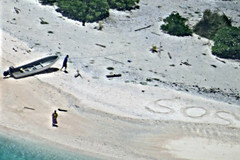 Two mariners who were stranded on an uninhabited Pacific island in Chuuk State, Federated States of Micronesia, are safe after writing “SOS” in the sand. 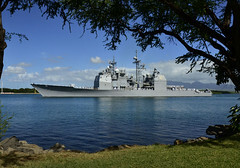 The ships will depart their homeport of Joint Base Pearl Harbor-Hickam Aug. 25 for a deployment to the 7th and 5th Fleet areas of operation. 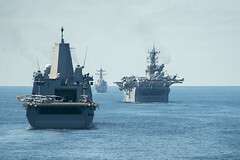 The Boxer Amphibious Ready Group (ARG), 13th Marine Expeditionary Unit (MEU) team completed operations in U.S. 7th Fleet and entered the U.S. 3rd Fleet area of operations, Aug. 25. Minister of Defense Tomomi Inada visited the forward-deployed aircraft carrier at U.S. Fleet Activities Yokosuka, Japan, Aug. 23.